Could you tell me something about it? The difference between 19th century Chinese porcelain replicas from Samson, is extremely hard to tell, even by looking at the piece first hand. From a picture only, it is almost impossibly. To take this tea caddy as an example, the base looks a trifle whiter than I would have expected from a Chinese piece, but my guess is that you by looking on the inside can judge from the quality of the paste and glaze whether it is Chinese or a Samson replica. If it is Chinese, it is from about 1760 and worth a considerably amount of money. If it is a Samson copy, it is still nice, but the price would be about a tenth of the original. Samson of Paris was, or actually are, a French firm specializing in reproductions and replacements of missing parts in antique sets of porcelain. It was founded in Paris in the early nineteenth century and are still in operation. Their pieces are not "worthless" since they are too antiques today, and collected as such, but they are normally made 100 years later then the originals - and in France. Chelsea, Meissen, Famille Verte, and Chinese Export porcelain are some of the wares that have been reproduced by the company. The firm uses a variety of marks on the reproductions and some of their pieces are not marked at all. This is the base of a Samson of Paris bowl. It is made during the 19th century. If you look at this and compare with a Famille rose bowl of the age this is supposed to look like, you will notice the dead white paste and glaze. If you look at the pink flowers and the green leafs in the decoration, you will notice that they are very similar to the late Famille Rose original. The leafs are a trifle too naturalistic, and somehow just a little to much attention is paid to one and each of them, but basically - there is no way to tell a difference, when you just got this bowl - and nothing to compare with. The gilt of the "French lily" border though, is definitely duller and darker than the Chinese counterparts are, and is larger in scale. If about half in size and of a lighter shade, we would have been fully convinced this is a Chinese bowl. On this example, you could also notice the uneven glaze on the base, but this is particular to this bowl. A Samson copy could have perfectly as even glaze as any Chinese original. On this particular bowl there is also some brownish branches that does not look Chinese and adds to the conviction, this is a replica. It is often very hard to see any difference between a Samson replica and the original, but it is there, as some difference in style, brushwork and porcelain paste, which is often a trifle whiter than the originals. I'll give you a checklist - since I can't handle the pieces. 1. The decoration is normally NOT possibly to separate between original and copy. 2. The weight - a Samson piece is sometimes lighter than the original. 3. The color of paste - a Samson piece look the same as a good quality Chinese piece, or sometimes whiter, sometimes a greenish tinge could be seen where the glaze is thicker than usual. 4. Defects - Samson pieces seems to be "better" than the Chinese and have less defects such as pinholes and glaze flaws. 5. 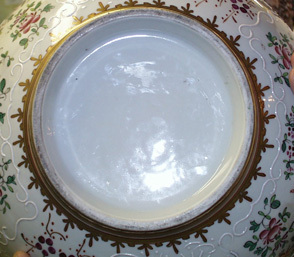 Yellow air bubbles under the glaze occurs on Chinese porcelain - I can't remember ever having seen any on a Samson piece. 6. Underglaze blue is a weak point to Samson, since cobalt does not seem to behave the same on Samson paste as on Chinese porcelain. It is normally darker than on the average Chinese porcelain, it flows out under the glaze a bit different than on Chinese porcelain. 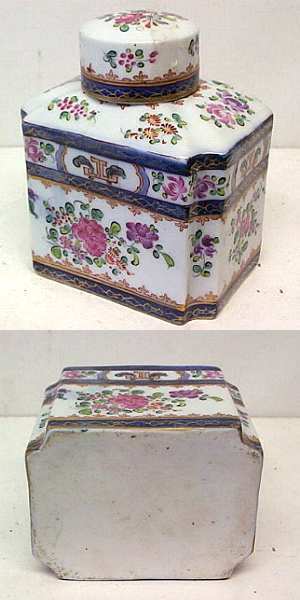 The inside of the lid and the inside of the tea caddy could also be expected to be much better on a copy than on a Chinese original. Any dirt, cracks, bristles, missing glaze, etc are "good" signs pointing towards a Chinese original.